Ethnic Communities’ Council of Victoria and the National Disability Insurance Agency (NDIA) are facilitating a FREE information session about the National Disability Insurance Scheme (NDIS). Do you want to know more about the NDIS? Do you work with people with a culturally and linguistically diverse background? Do you have a culturally and linguistically diverse background yourself? – What is the NDIS? 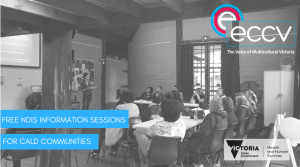 – How does the ECCV support people with a culturally and linguistically diverse background to access the NDIS? Please let us know if you need an interpreter!